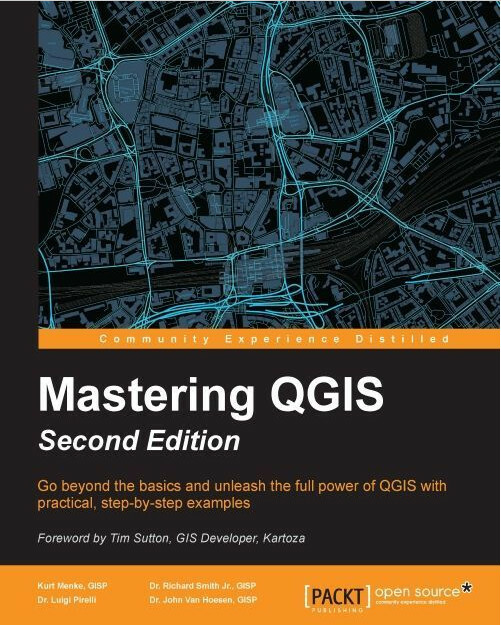 What's New in Mastering QGIS - 2nd Edition? 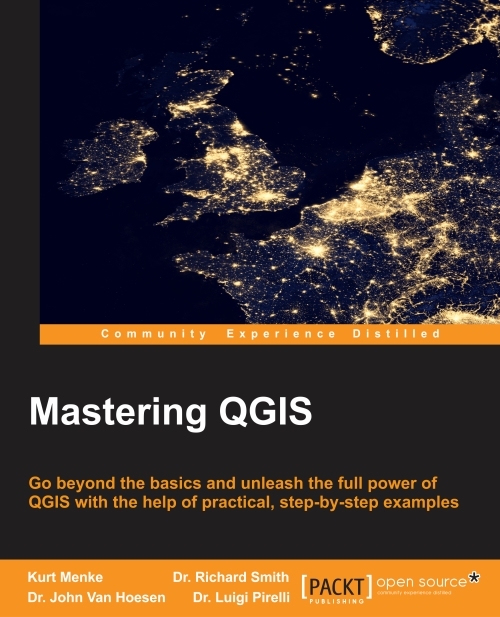 Myself, Rick Smith, Luigi Pirelli and John Van Hoesen are excited to announce the expanded second edition of Mastering QGIS. The goal of this book is to help intermediate and advanced users of GIS develop a deep understanding of the capabilities of QGIS while building the technical skills that would facilitate in making the shift from a proprietary GIS software package to QGIS. It is available in both hard copy and digital versions from Packt Publishing and Amazon. The book, which begins with a Foreword by Tim Sutton (QGIS Project Chairman), adds one new chapter, and 70 new pages from the first edition. Many new features have arisen in the last year. This book covers them all with step by step examples. This edition is updated to the latest long-term release version (2.14), and includes descriptions and examples of many new features. For example, this includes a new chapter on Advanced Data Visualization which covers live layer effects, QGIS2ThreeJS and Atlas generation. Chapter1,A Refreshing Look at QGIS, reviews installation and basic functionality of QGIS that are assumed knowledge for the remainder of the book. New material includes user interface themes and working with Custom QGIS variables. Chapter 2,Creating Spatial Databases, covers how to create and edit spatial databases using QGIS. While QGIS supports many spatial databases, SpatiaLite will be used in this chapter. First, core database concepts will be covered, followed by the creation of a spatial database. Next, importing, exporting as well as editing data will be covered. The chapter concludes with queries and view creation. Chapter3,Styling Raster and Vector Data, covers styling raster and vector data for display. First, color selection and color ramp management are covered. Next, single-band and multi-band raster data are styled using custom color ramps and blending modes. Next, complex vector styles and vector layer rendering are covered. Rounding out the chapter is the use of diagrams to display thematic map data. New material includes the numerous updates to the data Styling interface and all the new renderers (2.5D, heatmap, point displacement, inverted polygon & GRASS edit). Chapter4, Preparing Vector Data for Processing, covers techniques useful for turning raw vector data into a more usable form. The chapter starts with data massaging and modification techniques such as merging, creating indices, checking for geometry errors, and basic geoprocessing tools. Next, advanced field calculations are covered, followed by complex spatial and aspatial queries. The chapter ends by defining new or editing existing coordinate reference systems. New material includes: new geometry checker tools and conditional formatting for attribute table cells. Chapter5,Preparing Raster Data for Processing, covers the preparation of raster data for further processing using the GDAL menu tools and the Processing Toolbox algorithms. Specifically, these include reclassification, resampling, rescaling, mosaics, generating pyramids, and interpolation. The chapter concludes with raster and vector data model coversions. New material includes the Slicer plugin and the new raster alignment tool. Chapter6,Advanced Data Creation and Editing, provides advanced ways to create vector data. As there is a great deal of data in tabular format, this chapter will cover mapping coordinates and addresses from tables. Next, georeferencing of imagery into a target coordinate reference system will be covered. The final portion of the chapter will cover testing topological relationships in vector data and correcting any errors via topological editing. Chapter 7,Advanced Data Visualization is a brand new chapter! In it we provide advanced ways to display your analysis results. QGIS has a greatly expanded repertoire of layer styling and display options. In this chapter, you will learn how to use Live Layer Effects, utilize the inverted polygon and 2.5D renderers, create an Atlas in the Print Composer and use the QGIS2ThreeJS plugin to create a 3D view of your data. Chapter 8, Exploring the Processing Toolbox, begins with an explanation and exploration of the QGIS Processing Toolbox. Various algorithms and tools, available in the toolbox, will be used to complete common spatial analyses and geoprocessing tasks for both raster and vector formats. To illustrate how these processing tools might be applied to real-world questions, two hypothetical scenarios are illustrated by relying heavily on GRASS and SAGA tools. New material includes working with R tools and Lidar data with LASTools. Chapter9, Automating Workflows with the Graphical Modeler, covers purpose and use of the graphical modeler to automate analysis workflows. In the chapter, you will develop an automated tool/model that can be added to the Processing Toolbox. Chapter10, Creating Plugins for PyQGIS Problem Solving, covers the foundational information to create a Python plugin for QGIS. Information about the API and PyQGIS help will be covered first, followed by an introduction to the iface and QGis classes. Next, the steps required to create and structure a plugin will be covered. The chapter will be wrapped up after providing you with information on creating graphical user interfaces and setting up debugging environments to debug code easily. Chapter11, Python Analysis Scripting with QGIS, provides topics for integrating Python analysis scripts with QGIS outside of the Processing Toolbox. Layer loading and management are first covered, followed by an exploration of the vector data structure. Next, programmatic launching of other tools and external programs are covered. Lastly, the QGIS map canvas is covered with respect to how a script can interact with the map canvas and layers within. Discover QGIS Is Out in Print! I'm excited to announce my latest QGIS book! 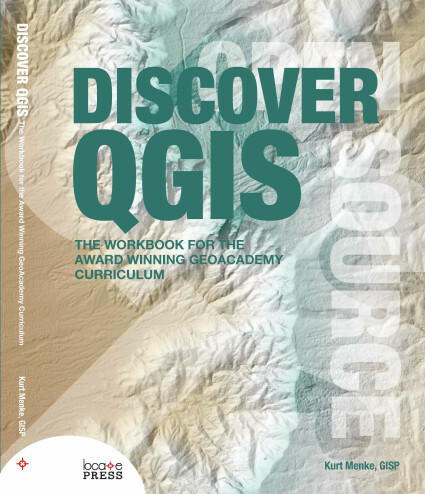 Called Discover QGIS, it is the workbook for the award winning GeoAcademy curriculum. It is essentially 5 college courses full of labs! It comes with all the data, challenge exercises and solution files. Great for learning GIS, QGIS or for use in the classroom. The GeoAcademy is the first ever GIS curriculum based on a national standard—the U.S. Department of Labor’s Geospatial Competency Model—a hierarchical model of the knowledge, skills, and abilities needed to work as a GIS professional in today’s marketplace. Originally written for QGIS v2.4, the GeoAcademy material in this workbook has been updated for use with QGIS v2.14, Inkscape v0.91, and GRASS GIS v7.0.3. This is the most up-to-date version of the GeoAcademy curriculum. To aid in learning, all exercise data includes solution files. 2016 Brings Two New QGIS Books! It's been such a busy year I haven't even had time to blog. Now that I'm sitting in my hotel room in Raleigh settling in for another FOSS4G, I finally have a bit of time. I've been doing a lot of GIS analysis, cartography, teaching, travelling to teach workshops, and blogging at Community Health Maps. I have also been working on the second edtion of Mastering QGIS and a brand new book Discover QGIS. Both books should be out in the next couple weeks! Mastering QGIS - 2nd Edition will be an updated version of last years book. All the material is being updated to the latest long-term release of QGIS v2.14. It wil also feature a new chapter on Advanced Data Visualization. This new chaptter will cover use of Live Layer Effects, 3d mapping with the 2.5D renderer and the QGIS2ThreeJS plugin, use cases for inverted polygon shapeburst fills, and atlas generation. Wiith Discover QGIS, the award winning GeoAcademy curriculum will be available in a workbook format. The material has been updated for use with QGIS 2.14, Inkscape 0.91, and GRASS GIS 7.0.3. The material is also backwards compatible to QGIS v2.8 despite minor GUI changes. It therefore represents the most up-to-date version of the GeoAcademy curriculum. It will be released in the coming weeks. It will include full solution files and a forward by Dr. Phil Davis. Look for both offerings soon! 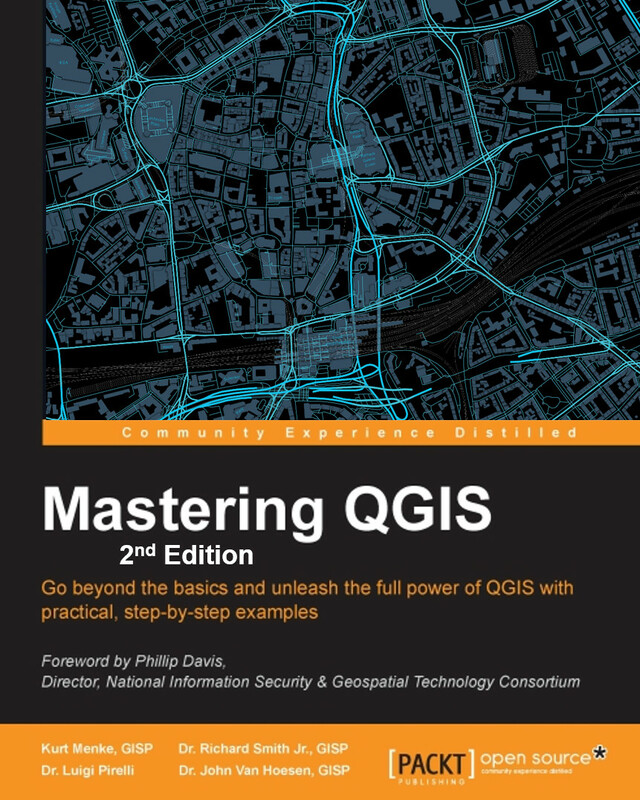 Mastering QGIS is Ready for your Bookshelves! It is with great excitement and pride that I announce our book Mastering QGIS has been published! I co-authored this book with Dr. Richard Smth, Dr. Luigi Pirelli and Dr. John Van Hoesen. It is available as both an eBook and in hard copy from Packt Publishing and Amazon. QGIS is the leading alternative to proprietary GIS software. Although QGIS is described as intuitive, it is also, by default, complex. Knowing which tools to use and how to apply them is essential to producing valuable deliverables on time. Starting with a refresher on QGIS basics, this book will take you all the way through to creating your first custom QGIS plugin. By the end of the book you will understand how to work with all the aspects of QGIS, and will be ready to use it for any type of GIS work. The introductory section servers as a quick start guide for those with little QGIS experience. It includes directions for installing QGIS on all the major platforms, reviews the layout of QGIS Desktop and Browser, and covers adding data, working with projections, querying tables, creating maps and finding and installing plugins. From the refresher, you will learn how to create, populate and manage a spatial database and walk through styling GIS data, from creating custom symbols and color ramps, to using blending modes. In the next section, you will discover how to prepare vector and raster data for processing and discover advanced data creation and editing techniques, such as geocoding, georeferencing and topological editing. The last third of the book covers more technical aspects of QGIS, including working with the Processing Toolbox, how to automate workflows with batch processing, and how to create graphical models. Finally, you learn how to create and run Python data processing scripts and write your own QGIS Plugin with pyqgis. This book is the most thorough tutorial for everyone needing a free and open source desktop GIS.